Unlike the blame approach, the no-blame approach usually requires a conscious decision for it to be adopted in a difficult situation or conflict. The blame approach tends to be a reaction rather than a considered choice and this is what places it in the same category as most ineffective responses to conflict. There is often little initial awareness that the blame approach has 'arrived' in a difficult situation or conflict and yet, once it is present, it can become the main focus of a dispute rather than to seek a way forward that resolves the difficulties present. This in itself is reflective of a 'conflict as competition' response in that the goal, or focus, is to find the person(s) 'at fault' - the 'loser(s)' - and distinguish them from everyone else - the 'winner(s)'. The no-blame approach is reflective of the 'conflict as an opportunity for learning, connection and insight' response in that a winner and a loser is not sought and the difficult situation is recognised as a situation requiring co-operation and a shared focus on resolution and not blame. Taking a no-blame approach is one of the Underlying Philosophies of Mediation. I am presently trying to sell a flat that I own. The sale is taking a lot longer than I expected because communication between the Estate Agent, my Solicitor and the buyer's Solicitor has not been effective. When I have called the Estate Agent or my Solicitor it has usually led to an understanding that the sale process had stalled somewhere. For example, at one point my Solicitor had not heard from the Estate Agent the name of the buyer's Solicitor, and was 'waiting to be told'. Or the Estate Agent had not heard from the buyer's Solicitor whether a survey had been done and so when I called to ask they didn't know. On calling them they found that it was done over a week ago. What often happens when I express my displeasure at this grinding to a halt of the sale process is a reaction of blaming the other service provider. This of course does not assist the progress of the sale in any way, but it does place the accuser in a position of claiming to be the winner in the blame game. The 'conflict as competition' approach is adopted and so the situation is not resolved with that focus as the energy for action is channelled into identifying a 'culprit' rather than putting actions into place to move the sale forward. Of course a further reaction can occur if the other service provider is given the blame, because they can then feel an impulse to pass it back to the original accuser over a different issue. 'You sent me the wrong papers so I couldn't contact the buyer's Solicitor so it's your fault'. Again, no action occurs to move the situation forward or identification of a co-operative approach which could be adopted to bring the necessary actions about in the future. Instead there is a past-focused, investigation so that fault can be identified and allocated. Neither provider accepts ownership of the situation and so resolution is prevented. As with other ineffective responses to conflict, those involved react by trying to pass ownership of their dispute to others. By not acknowledging their ability to respond effectively they resist accepting responsibility. As the client selling the property of course my experience is that I am receiving a very bad service. An adversarial situation exists rather than a co-operative one and so the service providers combine to reduce the effectiveness of their service through the ineffectiveness of their responses to conflict. The blame approach. This is the approach to which the no-blame approach provides an alternative. And yet the no-blame approach is often resisted and criticised. This is usually based on the view that the outcome of all conflict must be a winner and a loser. How often do we come across the situation where a purchase is made from a shop but when delivery is either late or missed or does not contain the full order or even the wrong contents, the shop blames the delivery company and the delivery company blames the shop. And the customer is left no further forward, is frustrated and may have wasted a day taken off work to receive the goods. Often shops will have 'outsourced' their delivery making it much easier for the blame approach to be adopted as the respondent in the shop can claim that it is not a reflection of the shop (thus trying to avoid blame). Of course, by doing so they are abdicating ownership of the conflict. But as discussed elsewhere, ownership can only rest with them. We will all have come across similar frustrating situations in other areas of life. Or perhaps we adopt it ourselves in our own lives? If so, we are the only ones who can acknowledge it and change our approach. If we wait for others to do so, we are still locked in the blame approach. There are of course some organisations that are able to effectively adopt a no-blame approach in their provision of services to clients. There are some families, employers, friends, siblings, colleagues etc. that do this. We are all able to adopt a no-blame approach. As with most responses to conflict we only tend to notice them when they have been ineffective and have become destructive and this occurs when we use the blame approach. 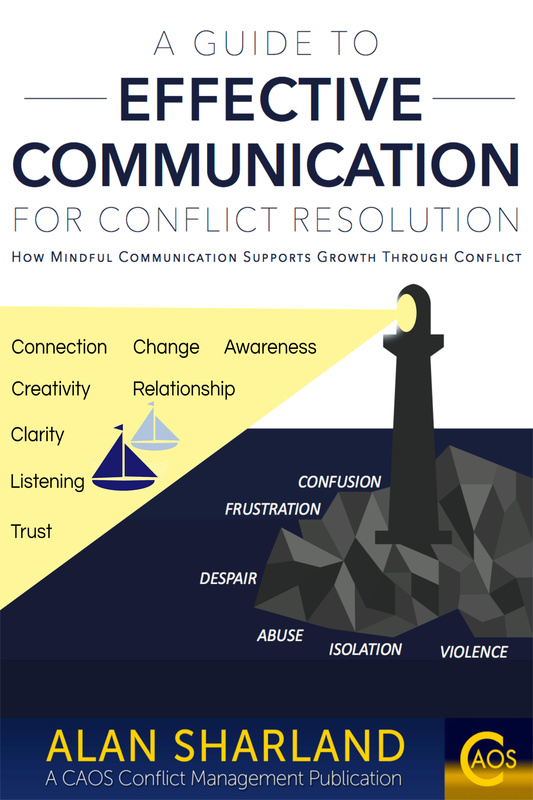 One of the aims of this website is to help to identify effective responses to conflict so that we can be empowered to make a choice to use them in difficult situations rather than rely on our reactions. The blame approach pervades many of our traditional processes within our organisations and that of many of our statutory bodies. It causes those caught up in it to have to 'defend' their actions even though they were mistakes, for to acknowledge them as mistakes would lead to condemnation of the individual rather than a review of the action (see Challenge the behaviour not the person) and a search for ways of doing things more effectively in the future. Countless opportunities for learning, connection and insight are lost via the blame approach and so processes that don't work remain in place, practices that fail are not changed, for to do so would be to acknowledge fault. Relationships are damaged, trust is lost, openness to change is inhibited. the intention to co-operate rather than condemn. See also Newsletter 8 which features an article about the No-blame approach. An added benefit is that when there is a no-blame approach, those who distance themselves from a difficult situation for fear of being 'associated' with it or being 'dragged in and blamed' do not feel that insecurity and so there can be a much wider involvement of others in the co-operative process that follows to resolve the situation. 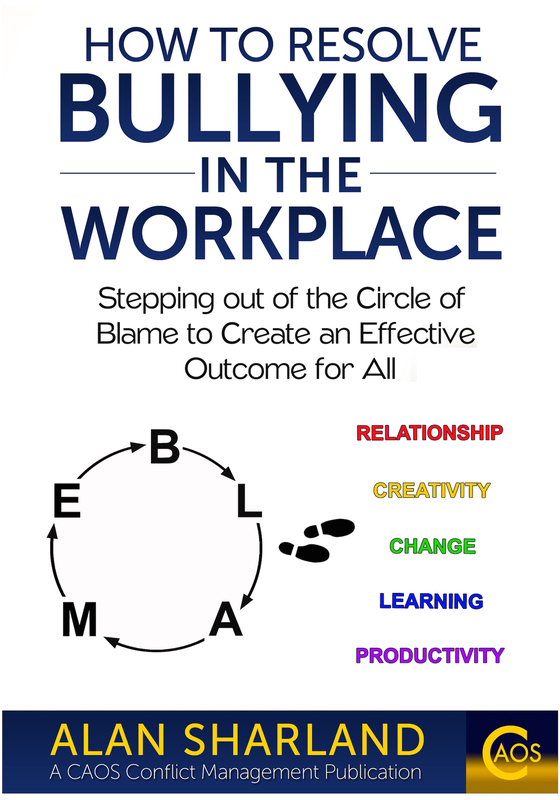 Purchase the book on Amazon in Kindle or Paperback: How to Resolve Bullying in the Workplace : Stepping out of the Circle of Blame to Create an Effective Outcome for All. Train to be a Mediator in London, UK with CAOS Conflict Management. It is refreshing to find reading material that informs and inspires and can provide a good resource for small organisations such as ours. I did a 1 hour workshop where I presented your Facts and Feelings Listening Exercise. We learned so much about how we listen and the consequences of not listening well that I was asked to purchase your book and have another Listening Meeting. My team just launched a project that could have whipped the team members and executives into a tremendous conflict. I required everyone to follow your rules for listening and it has been the best implementation we have had in 10years. Thank you for your generous and comprehensive communications and conflict resolution information. Thank you SO MUCH for this article! It brings forward some very key points about the phenomenon of "bullying" which I have been pondering for some while. Among others, asking to what extent can/should the person on the receiving end of the bullying/perceived to be bullying take responsibility/initiate steps to shift the paradigm? How can this happen without implying that the recipient is somehow responsible for the bullying behavior? To a certain extent the steps you suggest point to the strategies of NonViolent Communication: Observe and simply describe the behavior, understand and honor your own feelings and needs in the situation, and take responsibility for meeting them by making requests to change the situation. There has been a significant upsurge of email traffic about bullying in the last year among the members of the Int'l. Ombudsman's Association (principally the academic sector). Much of the exchange, in my view, has tended to favor the stance of "recipient of the behavior as victim," without agency to change the situation, thereby perpetuating the problem and doing a disservice to all. I will be forwarding this article to my colleagues to spice up the conversation!